Southern Garden History Society regularly publishes events held by nonprofits and organizations that are of interest to our members. These events include symposiums, lectures and tours that provide participants with a greater appreciation of garden history and restoration. 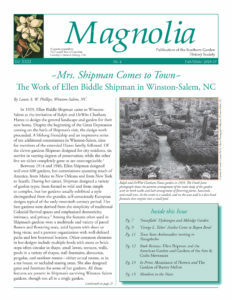 Requests for listings in our events calendar should be sent to Peggy Cornett, Magnolia editor. A lecture by Judith Tankard at the Birmingham Museum of Art. Proceeds benefit the Red Mountain Garden Club Memorial Garden. This symposium focuses on mixing tried-and-true traditions with new trends to great effect in a variety of gardens. Notable speakers include: Vincent Simeone (Planting Fields Arboretum), Ellen Ecker Ogden (food and garden writer), John Forti (Bedrock Gardens, NH), and Lee Reich (author), among others. From the U.S. National Arboretum, to the “outdoor museums” of the Smithsonian, the pristine garden rooms at Hillwood Estate, Museum & Gardens, and the United States Botanic Garden, one of the oldest botanic gardens in North America, the 2019 host gardens will inspire and spark dynamic exchanges that celebrate diversity of thought, experience, and contributions through horticultural practices and public engagement. This one-week course uses Monticello’s gardens and landscapes and the University of Virginia as outdoor classrooms to study historic landscape preservation. Lectures, workshops, field trips, and practical working experiences introduce students to the fields of landscape history, garden restoration, and historical horticulture. Celebrate the agricultural and epicurean legacy of Thomas Jefferson with workshops, lectures, and tomato tastings and family-friendly activities. Featuring the 2019 honorary chairs: chef, author, and food activist Alice Waters and Corby Kummer, senior editor and food columnist, The Atlantic. Speakers include Peter Hatch, Michael Twitty, Ira Wallace, and many more.